Did you know that according to the American Hospital Association, there are over 5,500 registered Hospitals across the United States? What’s even more staggering is that nurses only spend about 40% or 3.2 hours of their shift with patients. The average nurse will have four patients, which means only six minutes an hour is spent with each patient. So why are nurses only spending 40% of their shift with patients and not more? Well one of the biggest reasons is because they are out hunting and gathering for information, equipment and supplies. There are many different departments within a hospital, such as Radiology, Sterile Core, Central Supply, Pharmacy, Laboratory, Critical Care Units, and Emergency Department, to name a few and each one has their own storage needs. Storage for these areas has become a huge topic of discussion and has required facility managers to rethink how supplies and equipment are stored and retrieved daily. 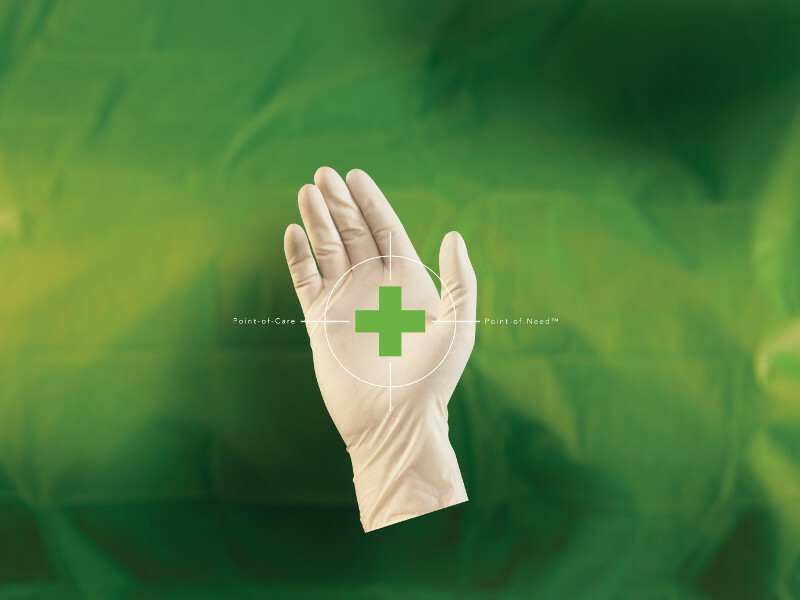 Hospitals and other healthcare facilities have been reaching out to storage experts to discuss how they can be more efficient within these supply areas and get nurses back to what they do best, patient care. If you haven’t had a chance to read any of the previous blogs or aren’t familiar with the concept of High Density Mobile Storage, take a moment now and read this article, Benefits of High-Density Mobile Storage. 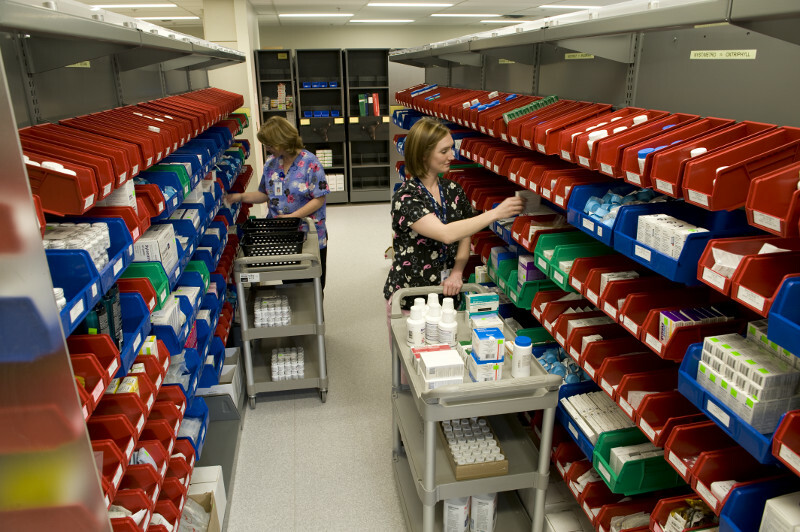 With the concept of high density mobile shelving, we can help organize and condense healthcare storage areas, and/or double the storage capacity within that same footprint. Spacesaver Intermountain offers a wide variety of storage solutions that bring supplies to the point of need and can reduce the overall time it takes gathering supplies. These high density systems compress two rows of storage into one deeper space, thereby “saving an aisle” when space is at a premium. These are great for smaller items that are typically stored on shelves and can be organized with various colored bins. These colored bins make it easier to find like items and when placed on our rail system, they have the adjustability to mount flush or with gravity feed for easier access to higher items. 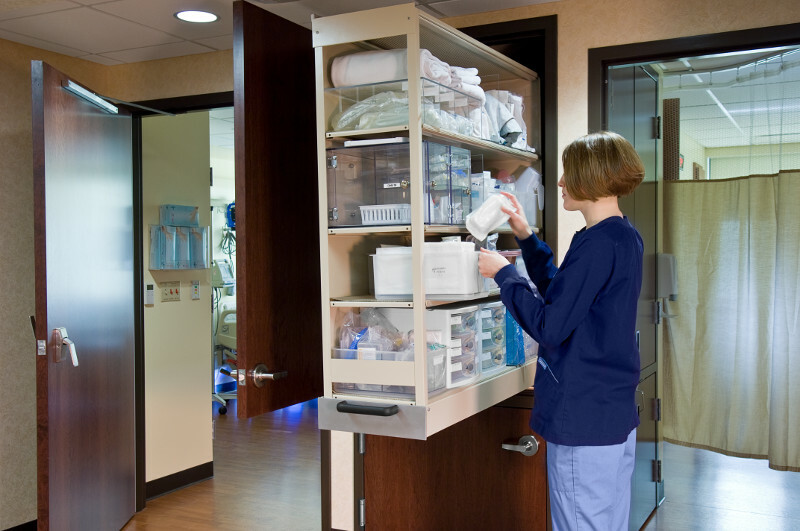 These unique storage systems offer point of need storage to nurses right within their patient’s room. As you can see with this image, the nurse server is located between two patient rooms and can be pulled out into the corridor to be filled and restocked and slid back into the wall for the nurses to access. There is a door within the patient’s room that then gives the nurse immediate access to equipment and supplies without having to leave the room to search for them. This makes for easy transfer of materials but doesn’t disturb the patient inside. Everything a nurse may need is just steps away from the bed. Wire shelving is an important part of healthcare storage because it’s extremely versatile and keeps dust from accumulating on the equipment and supplies. You can use it as static shelving, add casters to the bottom and have rolling wire shelving, or even mount the wire shelving onto mobile carriages and save the space that traditional wire shelving aisles would take up. With Quadadjust caps, you can add or remove a shelf without disassembling the entire shelf unit. These can be used on existing wire shelving and can hold twice as much weight as regular wire shelving. Ever wonder what to do with extra hospital beds and wheel chairs that are lying around the hospital? Well we have storage solutions for those as well. 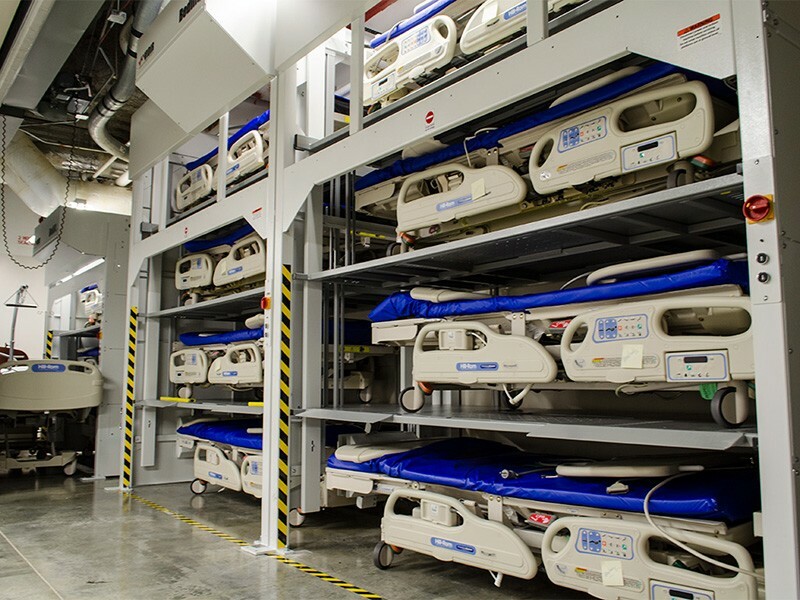 With the hospitals beds we have a storage system designed to store hospital beds off the floor and stack them securely in a vertical arrangement, which not only saves valuable floor space but removes any potential fire hazards from the hospital corridor. 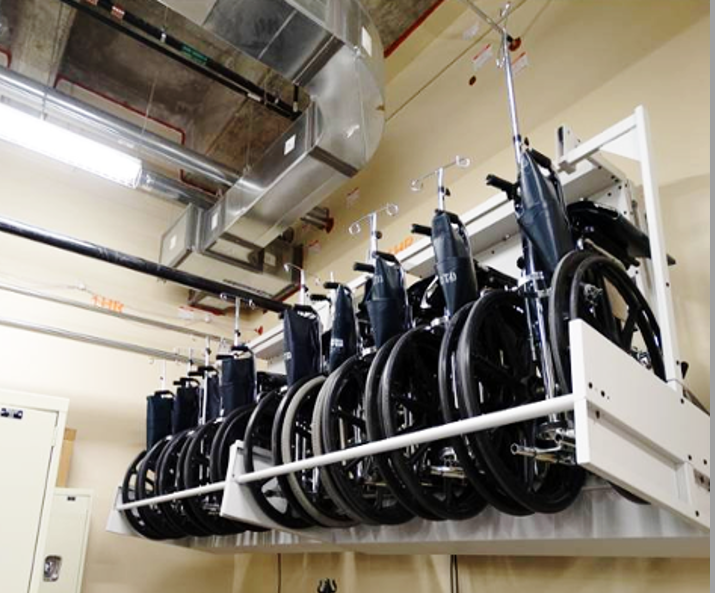 With wheel chairs you could use a system that securely stores them on an open wall or ceiling area to free up more of that valuable floor space. As we discussed previously, there are many different areas within a healthcare facility that need storage and Spacesaver Intermountain is here to help. If you have any questions or would like to talk with a storage specialist within the healthcare market, or any other market for that matter, contact us below and we would be happy to help any way we can.